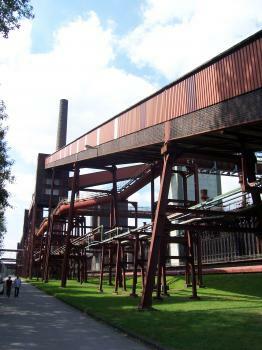 The Zollverein Coal Mine Industrial Complex in Essen represents the development of traditional heavy industries in Europe, and the innovative architecture that was used. Mining here started in the middle of the 19th century in the village of Katernberg. Because of its closeness to the major railway to Cologne, the site had the potential to grow. And it did grow indeed. This culminated in the construction of shaft no. 12 in 1930, with its outer landmarks often named the Eiffel Tower of the Ruhr Area. The architects were Fritz Schupp and Martin Kremmer, for whom both functionality and aesthetic qualities counted. I found it a bit spooky to walk here on my own on a quiet Sunday morning. The complex is huge, with multistorey buildings, bridges, railway lines and towers. All in the same dark red colour. Since the mining here stopped, nature is beginning to win back its territory. Most of the railway tracks and the smaller industrial leftovers are now covered with moss, grass and weeds. This adds a special atmosphere to the place - a good location for a film director to shoot a thriller. Many of the buildings nowadays are used for art exhibitions. The Red Dot Design Museum is worth a visit both for its collection of contemporary design and to take a look inside one of the industrial halls. The Zollverein site as such can be visited free of charge. Some buildings are currently used as museum, restaurant, ... and can be visited in this capacity. However, if you want access to (some of) the old production buildings, a guided tour is the only way. We took the 4 (!) 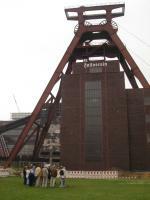 hour 'Von Kohle und Koks' tour which covers the both shaft XII coal mine and the coking plant. Unfortunately, this tour is only available in German but other (shorter) tours are also offered in English. We especially liked the coking plant as this part seemed a little less 'cleaned up' than the coal mine. Apart from the tour, it is also worth wandering around the rest of the site (shaft 1/2/8, the old train tracks, ...). Given the size of the site, one can spend a full day in Zollverein, especially if you intend to visit the musea (which we did not do). As mentioned by other reviewers, Völklingen Ironworks comes to mind as comparable site (i.e. closed down heavy industries). 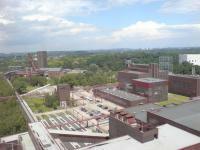 We preferred Völklingen over Zollverein, but Zollverein is certainly also worth a visit if you like 'industry WHS'. I absolutely loved this site - but I'm always a fan of the industrial heritage. It's been preserved really well (although I did prefer Volklingen for its aesthetics, I have to admit). There are several ways to approach a visit to Zollverein. You can go for the history, for the modern culture, or for a mixture. In terms of the history, it is possible to get guided tours of some of the original surface buildings of the coal mine, including the facilities that were used to handle the material being brought up from underground. If this is your first time to the site, it is well worth doing. Also, the Ruhr Museum in the former coal washing plant of Shaft 12 has permanent exhibitions about the history of the region and the mining industry on the site. It is a large and very well curated museum that would appeal to adults and children. I enjoyed Zollverein when I visited in August 2015. There was a German gourmet food festival going on (apparently not an oxymoron! ), with dozens of stalls selling food mostly consisting of pork. We took the opportunity to try currywurst for the first time, and washed it down with a welcome glass of Pilsner. Walking among great hulking industrial buildings and passing fearsome-looking pieces of mining paraphernalia was pleasant but also poignant. This site, after all, was a key engine of Germany's 1930s rearmament that contravened the Treaty of Versailles as it geared up to launch the Second World War. We reached the site on foot from the Essen-Zollverein Nord S-Bahn station, having come from Dusseldorf airport and changes trains in Essen. Oh dear – I am going to be the “party pooper” on this one! Everyone else has loved it. I thought it was “thin” on value and very poorly presented. Ok it is “big”. But so what? Perhaps the fact that I worked my whole career in heavy industry makes me less susceptible to seeing that as a “wow factor”. And a mine you can’t go down the shaft of?? Well it’s “neither use nor ornament” is it. Look at Blaenavon and Wieliczka. When you arrive, finding out what you can do from among all the options is like pulling teeth. One thing you can be sure of – almost everything costs “extra”! The tours seem designed to ensure that you can’t go on 2 of them on the same afternoon – and they cost an arm and a leg. We decided to go to the Ruhr Museum as it seemed to be the ONLY way we could visit the viewing platform, and paid our 8 Euro pp. This also allowed one to go to an additional section titled the “Portal of Industrial Heritage”. This seemed to consist of a large stairwell in which models of industrial buildings were hanging, followed by a room containing some industrial photos leading to a circular “cinema” with a totally missable 360 degree “propaganda” movie showing happy Ruhrgebieters enjoying themselves cycling, walking etc in their transformed industrial landscape. Whilst we waited for the next showing we decided to fill the time by going up to the viewing platform which we had climbed closer to. Big mistake – the door out turned out to be “one way”, and the only way back was down “n” floors, along and back up “m” floors! So, into the “Permanent Exhibition” of the Ruhr Museum situated in the “Washery”. Yes it was interesting if you wanted a general museum of the Ruhr and I certainly learned some things about the lives of the people there, but the linkage to Zollverein was only tangental. We also saw some nice carvings from Papua Niugini …… yes PNG!!! This regional museum contains a number of different collections and this aspect dated back to the days of “Kaiser-Wilhelmsland” when the German Empire reached as far as there. There was another exhibit containing some lovely fossils as well. But none of this was what I came for! The fact that it was situated in the “Washery” didn’t per se seem to add a great deal. Oh – I didn’t mention the “Special Exhibition” – another 6 euros. My only involvement with that was when I left the fossils on one floor to find a toilet – which was down the other end of the building on a different floor (The fossil “half floor” is the only one without a toilet!) I discovered that the “temporary exhibition” is inconveniently situated on the other half of the floor which is the same as that containing the fossils – so, unknowingly having gone down to it at the end with the toilets I discovered that one could not go through back to the fossils without the extra ticket (and the staff were rigid on this point!). So, back up a couple of floors – all the way along the building and back down again! German organization? So – lets go around the site. First, we had to pass by the “artwork” which consisted of water cascading from a great height onto the floor – or onto any visitors who wished to don raincoats which were provided for that purpose and get soaked. Very “arty”! The main “Bauhaus” type buildings were certainly worth viewing – but externally there was absolutely NO explanation about them – Zollverein could usefully learn from its compatriot site at Volklingen where the signage of what the buildings were was infinitely better. The Boiler House has been turned into the “Red Dot Design Museum” – another 6 Euros! We didn’t bother. Interestingly we noted via some old photos of this complex in the shop that it used to contain a chimney on its central structure so, what one sees today, isn’t strictly “authentic” (photo). Next past the Casino Restaurant – very chic and upmarket – a dessert will cost 11 euros. It too has been converted from some previous use and various boilers etc dot the floor. Lunch was already over – we walked round but didn’t didn’t really find the ambience worth paying for even if the food might have been. On to the Coke Ovens – “the largest in Europe” but all fenced of unless you go on a tour (of which there were no more at this time anyway). At Volklingen there are 2 coke ovens of different eras which can wonder round and fully appreciate from all sides (and I have worked in a coke oven!) There was another “free” artwork of opaque meaning and worth (“Silence, Exile and Deceipt. An Industrial Pantomime”) which allows one into part of the structure - but to little benefit. By this time we were pretty fed up with the whole place and walked back to the car park past various office blocks which had been rented out to design companies or were still “to let”, and had a last look over the site from the viewing platform (our tickets were valid all day for multiple visits!!). Well – you can take in the external views of Shaft 12 and the associated “iconic” buildings for free and, from what I have seen, that is what I would recommend. We didn’t of course go on the tours but I didn’t really want a lecture on coking etc anyway. This just seems to be a “day out” destination trading on its UNESCO credentials which are pretty hidden among all the associated “attractions”. I haven’t even mentioned the “Cultural workshops doing workshops on creative techniques”, the “Ceramic workshop”, the “printing workshop”, the “Sun Wheel” with 14 gondolas, the “Works Swimming pool”, the “Philharmonia Experience Field”, the “Ice Rink”………………. !! Don’t let me put you off if you prefer to follow the other reviews – but those were our feelings about the place. I visited this WHS in May 2013. The area includes 6 shafts, the coking plant and what has now been converted to the Ruhr Museum. There are 2 ways to explore this site: using the media guide and going around alone, together with a guide (only way to enter the coking plant). In the afternoon, the only tour in English is at 3pm and is 2 hours long. The Ruhr Museum is inside one of the shafts and offers an opportunity to see the old rusty machinery up close. The museum is huge and there are permanent exhibitions, temporary exhibitions, a 360 degree panoramic film, an observation deck to take in the breath of the whole Ruhr area and the Zollverein. If you visit this WHS on a rainy day you won't be disappointed! The Zollverein coal mine is always described with superlatives: “the most beautiful coal mine of the world” or “the largest coking plant in Europe”. Absolutely justified, the complex fascinates by its size and by the combination of powerful technology and extraordinary architecture. The WHS comprises three parts: the founding shaft 1/2/8, the shaft XII complex, and the coking plant. Coal mining at Zollverein began in 1847. In the following decades an industrial landscape of several connected pits emerged. At the beginning of the 1920s, the mine was no longer profitable and not further expandable. Thus, the owners decided to combine the facilities and to construct a new high-tech plant: Shaft XII. The special feature of Shaft XII is that all buildings were constructed according to a consistent architectural concept. In only four years, from 1928 to 1932, twenty cubic buildings were constructed inspired by the Bauhaus style. The buildings consist of steel frameworks and self-supporting curtain façades made of red brick. They not only looked good, they were also extraordinarily practical. The purpose of the individual buildings is not visible from the outside, the whole plant forms a functional and aesthetic unit. Like most visitors, we entered Zollverein at the so-called “Court of Honour" with the iconic headframe. The view is still as impressive as it probably was 80 years ago. We first went to the visitor centre in the former coal washing plant, visitors enter the building at the upper level via a modern escalator. Various guided tours are available, we took the "path of coal" tour, highly recommended. The guide explained the production processes of the coal: the separation of rock and coal, the sorting into different quality categories, the loading onto wagons, we have seen the conveyor belts, shaking screens, the tipper house etc. From the roof you have a beautiful view over the whole plant and the surrounding landscape. The coal washing plant also houses the Ruhr Museum. Its newly built, orange illuminated staircase is worth seeing. The museum shows the natural and cultural history of the Ruhr area, it does not refer specifically to the World Heritage site. We did only a short tour through the exhibition, a lunch break seemed more attractive, but the exhibition is very extensive and surely deserves more attention. Unfortunately, the information panels are in German only. Worth seeing is the Red Dot Design Museum in the former boiler house. The three-wing complex is one of the most impressive buildings of the mine. When you walk towards the entrance, the whole scenery reminds of a palace or castle – but with straight lines and cubic shapes without any ornament or decoration. Inside, one of the five huge boilers has been preserved, the others were opened and exhibition floors were installed. The museum presents contemporary product design: household objects, furniture, sports equipment, watches, etc. I liked very much this unusual combination of industrial heritage and modern design objects. The coking plant is the largest of the three parts and looks like what one would expect from an industrial site. The central part is the long row of more than 300 furnaces. Here the coal was baked to high-quality coke. The plant was operated from 1961 to 1993, now nature recaptures the territory. Grass, flowers and bushes are growing between the rotting installations and offer interesting views. Obviously there are also some rare species, because you can even book botanical tours. We spent the whole day at Zollverein, there is a lot to see. After a very good dinner at the Casino Zollverein we finished our visit with a stroll around shaft XII and the coking plant (the whole area is free accessible). 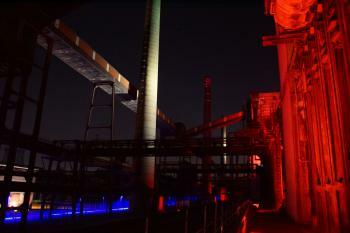 At night, the coking plant is illuminated with red and blue lights and offers a very special and spooky atmosphere. Zollverein is not only a museum and tourist attraction but also a good example of successful structural change. It is also a cultural centre: there are theatre and dance performances, artist studios and workshops, exhibitions of contemporary art, rooms for congresses and conferences. 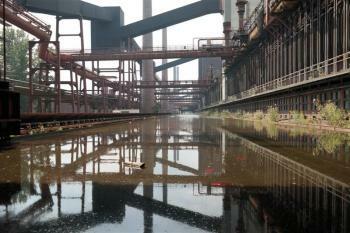 There are plans for an extension of the Zollverein WHS. A proposal consisting of about 20 additional sites has been submitted for the upcoming new German T-list. With good chances, I think. In August 2012, I managed to visit all the proposed sites. Zollverein is certainly the most outstanding industrial site in the Ruhr area, but there are also other rewarding destinations. 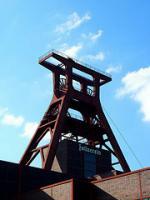 At least if one is interested in industrial heritage, it is worth to spend a few days in the Ruhr area. Much like other reviewers I just visited this site to tick another one of my list, however I found it to be a highly rewarding trip and Zollverein is one of the finest industrial WHS I have visited. When I first looked up the site I didn't realise the extent to which the Architecture of the site as an important part of the inscription. The fist complex was actually beautifully designed, a real functionalist masterpiece drawing on the influence of the Bauhaus movement. The modern additions to the site were well done, especially the bright orange escalator that led into Kohlenwasche in Schacht 12. There were maps dotted around the complex, however many times I did end up walking down paths that lead nowhere or to some sort of derelict end. However this was a real highlight for me, seeing the decaying ruins of the industrial past being absorbed and subsumed by the local fauna was really interesting, I just wish I had taken a better camera with me. After touring the first two complexes I moved on to the Kokerei. The massive decaying remains were actually quite beautiful. Unfortunately the Sonnerad (Ferris Wheel) was closed and the swimming pool was emptied of its water but it was still a great location to stop for a quick beer in the afternoon sun. This as one of the finest Industrial sites I have visited from the World Heritage list, and the well designed buildings and rotting industrial remains are actually quite beautiful, making this a rewarding site to visit in one of the industrial heartlands of western Europe. Very impressive structure and just the size, 1,1 km2 is a really big site. I loved the architecture, the great plan and that it was so strictly restored. A guided tour gives information that coal mining was hard work and that european coal mining is doomed as they have to go more than 1000m deep to find more coal. Very interesting, but you better learn german to understand homepage and information at site. Thanks to the World Cup that took me back to Germany again. Zollverein was on my list to visit for a long time, but going to Germany for just to see this industrial complex was quite worthless in my idea. This world cup opportunity made me decided to visit the Ruhr area in the morning before the match in the evening and Essen was my prime target. Ruhr area is an industrial powerhouse of Germany for a long time, but I really surprised to find out this region is very nice and very green despite of many factories and densely population. 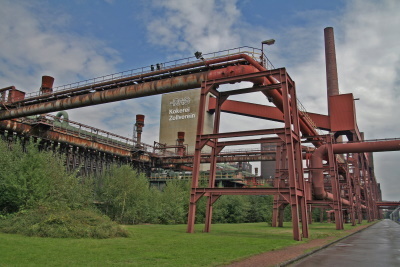 Essen or "Stahlstadt" by many Germans was famous for coal and Steal production and Krupp family with few tourist attractions, and the most popular sight is Zeche Zollverein coal mine complex. The complex is very big and has many buildings built in Bauhaus inspired style making this mine looks very stylish and modern. I have to admit that this mine complex is really unique and its buildings are worthwhile to see. Unfortunately, the main buildings were closed for restoration during my trip so I did not have opportunity to see the mining museum. But the complex is not just a museum; many buildings in the complex have been transformed to be contemporary art museum, conference hall, cinema, restaurant, and even casino. So far Zollverein is nice and should be the place to visit when you are in Essen. I also recommend you to go to this complex before it will transform to something strange. 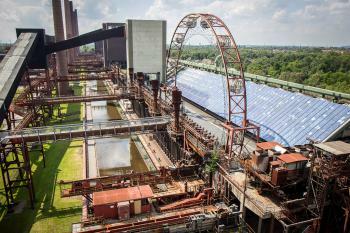 The development of this site is quite a hot issue in German news as some development devalued the significance of Zollverein which put it on world heritage list. (I think casino is a first step of bad development) The complex is just outside the town centre and from Essen Hbf takes tram no. 107 to Zeche Zollverein. The guide formerly worked in this coal mining complex and so he could tell us many things he experienced during his time there. It was interesting to get to know how this whole cole mining thing goes on. Nowadays most buildings are used for exhibitions, concerts etc. ... nice to visit, when you spend a day in Essen. And don't miss the beautiful synagogue in Essen's city centre. Being no particular fan of industrial history, I just went to Essen to see another WH site, but I was pleasantly surprised. Zollverein is a really big (14 sq.km) industrial complex that was the biggest coal mine of its day (1920s and 30s), and the grand industrial architecture served the purpose of impressing visitors with the mine owner's wealth and power. I took a guided tour that took almost 2.5 hours - the guide was really great and very informative. Now I know everything I never thought I wanted to know about coal-mining and especially about the miserable and dangerous lives of the miners there. The site is interesting for its architectural as well as economic and social history, and definitely deserves a visit. I visited only the Schacht XII and the coalwash. The guide was a young lady who really loves her job. Unfortunately it was only in german so i didnt understand everything well. The areal is built in cubism. If you are a fan of technics this is a must see, if not then in this site you can learn much about coalmining processes and history too. This site is quite large, so prepare to take good shoes. 3.0: Ivan Rucek Peter Loov Ian Cade Randi Thomsen Els Slots Nan MaxHeAnou Martina Ruckova FK Philipp Peterer Antonio J. International style: Criterion (ii): "application of the design concepts of the Modern Movement in architecture in a wholly industrial context"
Built in the 20th century: In 1927 two young architects, Martin Kremmer and Fritz Schupp, began work on designing the new central shaft site XII on the principle of "form follows function". Dubbed as another WHS: The 55mtr winding tower has been called "The Eiffel Tower of the Ruhr"